It’s always good to stay organized, but when you’re doing something as complex as moving into a new home, it’s not just good — it should be mandatory. When you’re moving into a new home, especially a rental, there are a lot of things you need to think about. There’s all of the generalities of moving — where to put your stuff, who gets what room, and so on — but then there’s all of the legalities as well. Applications for tenancy, rental history, proof of income, and so on always take up a vast amount of brain-space. It’s easy, among it all, to lose sight of the end-game: what happens when you finally decide to move out? Well, you’re going to have to clean up after yourself — and if there’s any damage the landlord finds that wasn’t there when you moved in, you’re going to have to pay for it out of your security deposit. 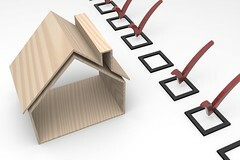 That’s why creating an Inspection Checklist is a critical part of moving in. A forthright landlord will encourage you to take your time with this document; a landlord of a more underhanded nature might just ask you to sign the document while it’s still blank. Your landlord is required by Michigan law to give you two copies of the inspection checklist (and a copy of the same document that the previous tenant left behind when they moved out, if you request it.) You have the option of supplementing that with your own evidence. The best bet, if you have the ability, is to go through the place with the landlord and a video camera, and record every square inch of the apartment. If you only have a still camera, that’s second best — just take pictures of everything, with close-ups of any actual damage you see and wide-angle pictures of absolutely everything. Ensure that the doors and windows open and close, that the faucets work with good water pressure and the sinks drain at a reasonable rate. Naturally, if you find any issues during this process or immediately after you move in, you should inform the landlord immediately! The landlord doesn’t live here, so they don’t know about every aspect of the residence — and Michigan law gives you two weeks to turn in a revised inspection checklist. Save it, write everything down, and give it to the landlord all at once so that he can take care of the maximum number of items with the minimum number of trips. Take those videos and/or pictures, and shortly after you’ve done the entire walk-through, watch them in slow motion (and/or go through the stills carefully) and write a description of every element of damage you see. If there are things that you noted but can’t see in the video, such as creaky or loose floorboards or off smells, write them down as well. Go room by room, and write everything that you notice in every room. Once your written description is done, it’s time to save all of this information. Give a copy of everything to the landlord, and keep three copies yourself — one on your hard drive, one on some piece of cloud storage like a Google Drive or in DropBox, and one physical copy like a CD with the relevant information on it in your ‘legal documents’ folder. With any luck (and a good relationship with your landlord), you won’t ever need all that documentation. You’ll move out, the landlord will respect what you’ve done to the place, and that will be that. But should there be a disagreement, you’ll have two times when you’ll be glad you had the assessment done. First, before the situation gets litigious, you can simply show the landlord your assessment and prove to them that no, the lock on the bathroom door never did work (or what have you.) Unless your landlord particularly dislikes you, this is usually enough to get them to back off on your security deposit. If, on the other hand, they refuse, you might need to take them to small claims court to get your deposit back. If that’s the case, your assessments will probably form the backbone of your case — and you’ll be doubly glad you had them available.